One more thing for Greece to worry about – undersea pools of carbon dioxide | Watts Up With That? The location of the second largest volcanic eruption in human history, the waters off Greece’s Santorini are the site of newly discovered opalescent pools forming at 250 meters depth. The interconnected series of meandering, iridescent white pools contain high concentrations of carbon dioxide (CO2) and may hold answers to questions related to deepsea carbon storage as well as provide a means of monitoring the volcano for future eruptions. Camilli and his colleagues from the University of Girona, National and Kapodistrian University of Athens, Institut de Physique du Globe de Paris, and Hellenic Centre for Marine Research (HCMR), working in the region in July 2012, used a series of sophisticated underwater exploration vehicles to locate and characterize the pools, which they call the Kallisti Limnes, from ancient Greek for “most beautiful lakes.” A prior volcanic crisis in 2011 had led the researchers to initiate their investigation at a site of known hydrothermal activity within the Santorini caldera. During a preliminary reconnaissance of a large seafloor fault the University of Girona’s autonomous underwater vehicle (AUV) Girona 500 identified subsea layers of water with unusual chemical properties. Following the AUV survey, the researchers then deployed HCMR’s Thetis human occupied vehicle. The submersible’s crew used robotic onboard chemical sensors to track the faint water column chemical signature up along the caldera wall where they discovered the pools within localized depressions of the caldera wall. Finally, the researchers sent a smaller remotely operated vehicle (ROV), to sample the pools’ hydrothermal fluids. Where is this CO2 coming from? The volcanic complex of Santorini is the most active part of the Hellenic Volcanic Arc. The region is characterized by earthquakes caused by the subduction of the African tectonic plate underneath the Eurasian plate. During subduction, CO2 can be released by magma degassing, or from sedimentary materials such as limestone which undergo alteration while being subjected to enormous pressure and temperature. The researchers determined that the pools have a very low pH, making them quite acidic, and therefore, devoid of calcifying organisms. But, they believe, silica-based organisms could be the source of the opal in the pool fluids. Until the discovery of these CO2-dense pools, the assumption has been that when CO2 is released into the ocean, it disperses into the surrounding water. “But what we have here,” says Camilli, “is like a ‘black and tan’ – think Guinness and Bass – where the two fluids actually remain separate” with the denser CO2 water sinking to form the pool. The discovery has implications for the build up of CO2 in other areas with limited circulation, including the nearby Kolumbo underwater volcano, which is completely enclosed. “Our finding suggests the CO2 may collect in the deepest regions of the crater. It would be interesting to see,” Camilli said, adding it does have implications for carbon capture and storage. Sub-seafloor storage is gaining acceptance as a means of reducing heat-trapping CO2 in the atmosphere and lessening the acidifying impacts of CO2 in the ocean. But before fully embracing the concept, society needs to understand the risks involved in the event of release. Temperature sensors installed by the team revealed that the Kallisti Limnes were 5°C above that of surrounding waters. According to co-author Javier Escartin, “this heat is likely the result of hydrothermal fluid circulation within the crust and above a deeper heat source, such as a magma chamber.” These temperatures may provide a useful gauge to study the evolution of the system. Escartin added that “temperature records of hydrothermal fluids can show variations in heat sources at depth such as melt influx to the magma chamber. The pool fluids also respond to variations in pressure, such as tides, and this informs us of the permeability structure of the sub-seafloor.” Changes in the pools’ temperature and chemical signals may thus complement other monitoring techniques as useful indicators of increased or decreased volcanism. This European – American research collaboration was funded through support from the EU Eurofleets program, Institut de Physique du Globe de Paris, Hellenic Centre for Marine Research, the US National Science Foundation, and NASA’s astrobiology program (ASTEP) which supports autonomous technology development to search for life on other planets. “From a technology perspective, it was a big step forward,” Camilli said. July 17, 2015 in Carbon dioxide, Oceans. Maybe I’m too cynical these day. No! They emit fairy farts that smell like rose buds! C’mon…you guys knew that, it’s in the literature”, right? At least they may have rich harvest of edible sea algae, since the EU is driving them into total starvation. Greece chose to run its economy in a fashion that led to where it is now. All socialist governments go broke after they have created broad dependency of its citizens to ever growing government. Someday there is not enough government money for everyone and the systems starts to collapse. This happens when those dependent upon taxpayers money grow faster than the taxpayers can grow and collapse occurs. The government then starts borrowing more and more money to grow the dependence until their ability to tax and borrow is exceed by the demands of the dependents and the crash is made even worse. US debt now exceeds US GDP. All volcanoes emit CO2. Vulcanogenic CO2 is the prime production process on the planet for this life giving natural gas. Santorini is still active buuilding up for the next big one in several thousand years. That said, this appears to be – at base – a bit of real science. The researchers actually looked at the pools of – slightly different – water, in ‘localized depressions of the caldera wall’. Now, I’m stronger on ocean/sea surfaces than the things happening in their depths. But I wonder whether this may – perhaps – be useful. Could this give some indication of possible future volcanism? Mind, didn’t we have an article a few days ago about some WHOI grad student who’d swallowed bushels of the Kool-Aid? Auto – whose scepticality pH seems not to be constant! Current estimates of volcanic CO2 are at least an order of magnitude below actual amounts. Yes. The phrase “carbon capture and storage” gives me the chills because it is one of the most anti-life things possible. Damn I wish I was there . I’ll send the notice to my Manhattan Libertarian friends and see if any are up to going and asking him how he answers my Heartland presentation showing the order of magnitude impossibility of Venus’s extreme surface temperature being due to a 225% solar heat gain despite having an albedo wrt to the solar spectrum approaching 0.9 . But whatever he says will cost us. “Now these never-before-seen pools in the volcano’s crater may help our civilization answer important questions about how carbon dioxide behaves in the ocean. Yeah, questions like ‘what happens if you run a AUV through a 3500 year old pocket of CO2?” Answer, it churns it up and releases it into the atmosphere. Disturbing a pool of CO2 or even a pool of CO2-saturated water will cause the CO2 to form bubbles. This becomes a geyser that, in turn, forms a toroidal flow pattern, upsetting the stable pool and making more bubbles. The toroid rapidly expands to reach the surface. The CO2 effluent can reach nearby populations, smothering them in seconds. The lower density of the water in and above the toroid is insufficient to float a boat. If you are sailing over the CO2 pool when it erupts, you will suddenly sink into the sea and die. Here is woods hole own take on this with a little more info and photos. I get no sense of the size of these pools but as the press release says there are implications for the emerging technology of carbon capture. Why the co2 didn’t become absorbed into the water to become part of the sink/ source cycle but instead emerged in this form isn’t explained at present. It is dissolved in water. The lack of disturbance naturally results in CO2 pooling at the bottom, since it’s heavier. The same thing happens in air. With zero wind, CO2 settles to the ground, greatly increasing concentration levels. This is when plants absorb it. As soon as the wind blows, it becomes well-mixed again. What I wonder is if something similar can happen with bio/decomposition sourced CO2 (and methatne?) in the deep ocean. There could be pools of high concentration CO2 and methane and clathrates of varying ages, young and old, scattered all over the ocean floor. Sure it is: CO2 is the spoiled rich kid of the molecular world…it can do whatever the hell it wants! Always twisting it back into a fear of carbon dioxide in the atmosphere vs. gathering it into dangerous concentrations in CCS. Or perhaps subtly pointing out that schemes involving uncontained CO2 are potentially hazardous. Everybody remembers Lake Nyos. I wonder how high concentrations of CO2 in the water makes it more dense. The CO2 molecule weighs 2.44 times a much as the H2O molecule, but doesn’t take up that much more space. Liquid CO2 but not gaseous. If not chemically bound in some fashion like the methane clathrates, it would bubble up like in a cherry soda. Just a question here: since co2 is heavier than h2o why is it a gas and h2o a liquid? jon asks an interesting question. It is a matter of quantity and concentration, and temperature and pressure. H2O IS a gas in the atmosphere–that’s what forms clouds. Water is a highly polar molecule and the highly positive H atoms in one molecule are so strongly attracted to the electronegative oxygen of the next one that you don’t really see any “H2O” as such in liquid water until it hits the boiling point. What you really have is a fluid collection of items such as (H20)6. NO, the answer is hydrogen bonding! H2O remains a liquid at a far higher temp than other species of equal molecular weight due to hydrogen bonding. Another such molecule is ammonia…but water is the champ. And substances dissolved in water do not increase the volume of the water by an amount that one would expect from size of molecules alone. Try filling a glass with water, and then slowing adding salt or sugar, making sure the solid dissolves completely. Sorry ladylifegrows, I answered before reading your whole comment. Hydrogen bonds are distinct and more powerful that London forces and other types of van der Waals forces. I do not think group of six are expected to be formed, in general. These bonds are highly transient, lasting a tiny fraction of a second. Maybe less than one billionth of a second each. Hydrogen bonding is not a simple ionic bond as your description seems to imply, but has some covalent characteristics. Water is the most notable example of hydrogen bonding increasing the boiling point due to two lone pairs of electrons on the oxygen atom, and the two hydrogens, which means that the max number of hydrogen bonds is four. Also, remember that the dissociation constant of water means that some molecules exist as hydronium and hydroxide at any given time. I thought cold water could hold higher concentrations of CO2 than warmer water. In general, and all other factors being equal, the solubility of solids in a liquid increases with temperature, while that of gases decrease with temp. This is true for water as it is for most other liquids, and applies to most but not necessarily all gases and solids which may dissolve in them. The reason for this is easy to visualize, although the details of the physical chemistry can get very tricky indeed. Think of the velocity of a gas molecule in a liquid, and what must take place for it to remain in the liquid or, conversely, for it to evaporate out. The average velocity of a molecule or atom in a fluid is proportional to the temperature, but this average represents a range of velocities carried by individual atoms or molecules. At the high end of this range, a certain number will carry sufficient velocity to escape the surface of the liquid. The higher the temp, the more will be travelling above the critical threshold of velocity to enable escaping the surface of the liquid. The situation with solids is somewhat different, but the same principles cause molecules of a solid to also carry a range of velocities. Those on the low end of the range will carry insufficient velocity to remain suspended in the liquid, and will settle out of solution. Other factors play a role, depending on the substance, the temperature and the pressure, etc. The above is a huge generalization, but is valid for providing a mental picture of what occurs, and why solubility in a liquid increases with temp for solids, but decreases with gases. One more bit of unknown science creates a stir – what a surprise. But, the science is settled. ‘religious science’ … note the number of times “we believe” is used! concentrated? I’m not sure how one would go about concatenating a lake. Concatenated. The ‘ponds’ are likely connected (subsurface fissures through which the CO2 is injected into the sea floor) so that when something happens to one, it directly affects the others. Don’t be sailing over the pools when the CO2 erupts. I’ve pointed out several times that CO2 is heavier than water (44 > 18), but a true believer in CO2 magic claimed that wasn’t true. Don’t be thick! This isn’t liquid CO2 it is a fluid “high in CO2”. Bubble some gas in water and tell me which way it goes. Also, it is reactive with water and forms several ion combinations. There is an education to be had here if you don’t fight too hard against it. Do you mean to say that “liquid CO2 is heavier than water” or did you really mean to say that CO2, which is normally defined as a gas molecule, is heavier than water? Because CO2 the gas has a higher atomic weight than H2O, but H2O as a liquid, is denser than CO2 as a gas. It is possible for a material made of atoms of a lower atomic number to be heavier than that of a high atomic number for a given volume. I recall designing a small shelter for CO2 cylinders many years ago and placing vents near the floor. Gary and Aphan, the states of matter are models for how collections of the same molecules interact with each other. An individual molecule is neither solid, liquid nor gas. CO2 dissolves in water and will diffuse throughout. However, if allowed to settle to steady state, gravity will cause a greater downward force on CO2 molecules than the others. Gary, you’re getting confused by carbonated water which has a partial pressure of CO2 greater than it would be at ambient pressure and temperature. When the pressure is released, CO2 is squeezed out, forming CO2 bubbles. The kinetic energy of the CO2 molecules is such that when together with other CO2 molecules, they form a gas, take up volume greater than their weight, and therefore, float upwards. For God’s sake, hasn’t anyone heard of the 1986 Lake Nyos disaster?? One little rumble from Santorini, and we have a huge limnic eruption on our hands. chill. the topography around the CO2 lakes is crucial to how those deadly events happen. Just because nobody would get hurt doesn’t mean that it wouldn’t belch out more CO2 than humankind could hope to produce in a decade. And then when catastrophic warming didn’t follow, we could point and laugh at Hansen, Mann, et al. If you have to postulate the existence something completely alien to all known empirical science to account for something that is merely an extension of known physics, you *might* be blowing hot air out your exhaust port. I did not catch that at first, because there some diatom-like plankton that have silica shells. 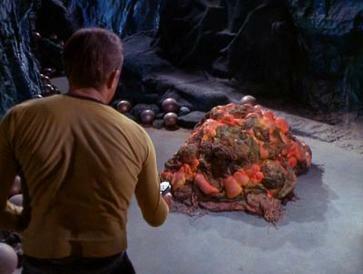 Unless you have a pet Horta, silica based life is something else. Original Star Trek episode 25. Come horta, horta, horta. Nice little horta. I remember seeing that episode when it first aired when I was a young lad – and it scared the heck out of me (as did the old Outer Limits shows). I think they’re referring to invertebrates that shield and stengthen their bodies with silicates rather than carbonates. That is probably a translation hiccup. I think they meant the opal had something to do with microorganisms that use silica in stead of CaCO3 for their tests (shells). That’s what I thought when I read “silicon based organisms”…errr…wut? In fact, increased volcanic activity somewhere in the deep ocean could explain the current increases in atmospheric CO2. Increased CO2 levels in deep waters is steadily released as currents bring that water to the surface and the lower pressure allows the gas to escape to the atmosphere. I saw a bumper sticker once that said “outlaw subduction”, which I thought was funny. One interesting question is how persistent are these pools. Diffusion, which is entropy driven, is a powerful force to drive mixing. On the other hand, you get a huge density gradient set up which resists any sort of bulk mixing. So you end up with a meta-stable system, which can be quite persistent. But we remember that “meta-stable” is not the same as “stable”, they are different. There is a lot more than CO2 coming out of these hydrothermal fluids and they are commonly greatly elevated in silica, base metals, sulphur etc. You’d a thought that they would have given us a good chemical analysis of this stuff – they mention silica, but they leave one to think that it is basically CO2. It occurs at a depth of only 250m, ~25 atmospheres which at what? 10C -15C temp, CO2 is a gas. There are many much deeper basins in the Greek seas which have saline, stratified waters which are enriched in CO2, S gases and methane. Many are warm due to aerobic and anoxic microbial activity and not volcanic exhalations. Microbe sampling has identified layered communities of microbes in these waters. Thanks. Do you have good links about this? The famous “dog cave” near Naples (where a dog would suffocate, but a human may pass) has a watery equivalent. Revolutionary! Besides CO2 storage, it has greater potential for data point selection bias in ocean acidification papers. The same groups that demonize fracking want to save the planer by injecting huge amounts of carbon dioxide (in some form) into the earth’s crust under the oceans. Gee, nothing could go wrong from doing this, could it? Given all the hoopla about CO2 making the oceans more acidic, can I assume that they observed fish dissolving in these pools. Surely all that CO2 should have made these pools acidic enough to dissolve rocks as well. Another government grant, A nice holiday in the the Med sailing around the volcanic complex of Santorini is the most active part of the Hellenic Volcanic Arc. Oh what a surprise there are higher levels of Co2 from the dormant volcano. OMG!!!!!! Lake Nyos got dangerous because the lake does not turn over (neither does the Aegean Sea), the lake occupied a caldera (as does the Aegean around Santorini), and the CO2 from the magma seeped out of the magma chamber, up through the rocks, incidentally cooling down as it did so, until it dissolved in the water. Solubility of CO2 in water is increased by increased pressure and decreasing temperature, which both apply at the bottom of the water column. So the CO2 accumulates, supersaturating the water at the bottom of the column. Unwilling to suffocate more of their own people, Cameroon decided to test outgassing the dangerous bottom layers of Lake Nyos. They stuck a vertical pipe in the water, pumped out about a third of the water, and jumped back–the force of CO2 coming out of solution was enough to propel the water column up the pipe and out, I believe 40 feet in the air. They just left it there, and it runs itself. Left alone, Santorini’s waters will supersaturate with CO2 until disturbed–then it will be like Diet Coke and Mentos in the Aegean. Instead of speeding up this process by stuffing flue gas into the water, the Wizards of Smart at Woods Hole might instead decide to warn the folks nearby about the danger. The last time Santorini blew its top was in about 1600BC. It caused darkness and an ashfall for three days across much of the Eastern Med, including Egypt. This light ashfall accounts for the ‘air being too thick to breathe’, and the Egyptians being ‘inwardly consumed’ as Josephus Flavius tells the story. There was also a large tsunami, which was meticulously documented. Santorini also caused the huge floating islands of Aeolia and Mordrain (vast pumice rafts). But I had not factored in the CO2 release previously. The intitial climatic response to such a large volcano would be a cooling, but was there a CO2 increase and warming too? The Minoan Warming was about the 1,500 BC mark, but the charts I have seen are not accurate enough to determine if these events were coincident. Something doesn’t add up here. Notice that the Kallisti Limnes are mentioned to be filled with opalescent water at the beginning of the article and then they allude to this only once more when they mention that silica-based organisms (assumable they mean silica frustule building organisms) may be the source of the opal. The rest of the article and research seems to focus on their “god molecule” CO2. Carbonic acid is only very slightly denser than water –1,000 kg/m^3 vs 999.97 kg/m^3 — but the water in the Kallisti Limnes was 5 degrees warmer than the surrounding water. Am I missing something here or is CO2 clearly not the reason why the water is dense enough to be trapped in the depressions when it is 5 degrees warmer than the water above it? Could it perhaps have something to do with the opal dissolved in the water? Silicic acid has a density of around 2,200 kg/m^3 and seems much more likely to be the reason for the Kallisti Limnes, but then again it’s so hard to determine anything from press releases when everything is given in qualitative terms. individual CO2 molecules don’t have a “state”. They are simply dissolved in water. Good point RW. It seems likely that microorganism, perhaps fed by silica enriched volcanic exhalation were the main cause of CO2 buildup and warmer water temperatures. So, how much CO2 volcanoes and underground fissures really produce? It’s been 20 years since I am asking this questions, and I am getting only completely unsubstantiated Ferdinand-style answers juggling completely unsubstantiated “Gty” figures. They don’t know, do they? They probably don’t WANT to know. If the Lake Nyos seep is typical, there’s a lot more CO2 coming from volcanoes than anyone realizes. The Nyiragongo volcano seeps are also mostly CO2. Lake Nyos represents the only place where 100% of the gaseous output of a seep has been captured. I recall that the low CO2 attributed to volcanoes was based on a handful of samples. So many things have been there for millennium but the first time somebody takes notice, it becomes a crisis. Your tax dollars at work being collected. For a so-called scientific paper, this paper seems to be fatally short of any science. Coming over all poetic about ‘ iridescent white pools containing high concentrations of carbon dioxide’ doesn’t really cut it as science; neither do comments about low pH and speculation about carbon capture and storage. What’s the hydration equilibrium constant for carbonic acid down there at about 25 bar and 288K? What chemistry is going on? I’ve seen estimated of the CO2 output from a volcano that range all over the place. Does anyone know of a trusted source for the actual CO2 output of an average volcano? How many active underseas volcanoes there are? How many years equivalent of Fossil Fuels burning does an average Volcano represent? I’ve seen estimates that a single Volcano can produce the CO2 equivalent of the past 150 years of anthropogenic CO2. Can anyone confirm that statistic? It’s just an estimate based on extrapolating a count over a limited area. I’m a bit skeptical about the number of “150 years of anthropogenic CO2 from a single volcano:” I think the total volcanic CO2 is estimated as 0.12 Gigatonnes (as Carbon) per year. Extrapolating from the Lake Nyos seep and multiplying by 3 million subsea volcanoes gives 8.0 GT C/year, a substantial fraction of the putative 35 GT/year for anthropogenic carbon (Gerlach). The jury is very much out on this; the science is unsettled. What is an “Average volcano”? You have volcanos that sit there for hundreds or thousands of years and do nothing, then suddenly blow their top (think Vesuvius, Mt St Helens). On the other hand there are those that are in a permanent state of eruption – Etna, Stromboli, etc. Someone asked why the ‘pools’ of CO2 did not disperse. All you need is a small fissure leaking CO2 (or methane) to keep the supply up, to balance the amount dispersed by mixing and drifting away at the top. (CH4 + 2O2 = CO2 + 2H20). A scientist who investigated the Lake Monoun disaster came up with the theory that the CO2 concentration at the bottom had got too great and caused the instability which resulted in the CO2 eruption. This was confirmed by a scientist investigating the Lake Nyos disaster, and eventually led to the possibility of a self-operating pump using gaseous CO2 created by it coming out of solution as the water was sucked up the pipe, initially by pumps to get it started. IIRC, it took about 3 days for the pipe to become a ‘self acting’ CO2 pump. This reference comes from a video I saw – possibly produced by the BBC. I have not been able to find that video, but I found this which is a very good National Geographic documentary explaining the disasters. BTW, the fountain produced by the self acting CO2 pump was stated (elsewhere) to be 21 metres high. There’s something like a total of 80,000 km of spreading tectonic ridges on Earth, not only in each ocean but also places like Lake Baikal. The number of sub-aqueous vents has never been counted, so their emissions of methane, carbon dioxide, sulfur dioxide, hydrochloric acid, hydrofluoric acid, etc., has never been measured. Rather than succumbing to the temptation of premature exclamation, such careful observation and measurement might just be the scientific thing to do. If these pools are high in CO2 and low pH then they’re perfect for getting an understanding of what happens to the sea in extremis. Are there any carbon-based lifeforms living in the pools? Is the temperature higher than in the surrounding water? Are corals being bleached? Are shells being eroded? Wouldn’t it be wonderful if some empirical science were to be done here! It’s OK. The EU bank has just approved a loan to Greece so that it can pay debt/interest on debt, or rather pay loans the EU bank granted Greece. I mean, what could possibly go wrong with borrowing money to pay interest/debt on borrowed money? 80% of earth’s volcanoes are under the oceans. 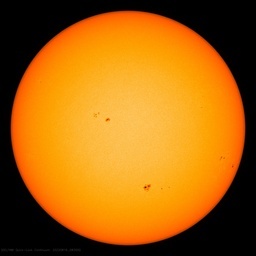 They spew CO2, amongst many other things, in amounts that dwarf the human contribution of CO2 to the atmosphere. To then suggest human activity CO2 drives the climate and is causing catastrophic global warming is simply childish ignorance. Mostly I am trollish but here I think my comments will be relevant. P Ward J Kirshvink The New History of Life refers to the idea that the highs and lows of O2 and CO2 have controlled all of Earth’s life history. Our speciation, the origin of live births, why dinos were upright — it is a great read. Historically people have lived beside inland seas –Black, Med, etc., so it is no surprise that CO2 is noted there more than anywhere else. Homer’s Greeks were subject to CO2 releases, probably the Early Copper Age experienced CO2 floods as well. Of course history cant record what it cant see or identify. The closest history come to this is the Delphi Oracle.